The SUB is a kitchen knife block that has been updated to stand proudly amongst todays modern, digital and inter-active appliances. The SUB features widespread technologies such as Bluetooth an WiFi capabilities, Aux Jack, reflex speakers and a Voice-Command system. The Sub offers what I refer to as the 3 F's. Form, Function and FUN! The 7" tablet has inter-net access to offer many types of entertainment and media selections. Perhaps some cooking lessons on line? make sure the SUB, is part of your recipe! with royalties, and outright sale of patent and registered trademark items, (Logo and Tagline). The Sub is new on the scene. It has been shown at two shows in working prototype form in 2017. The SUB grabbed the Gold Medal at INPEX 2017 in its category. It has been the talk on many net sites and channels, and has even made the local newspaper in the inventors city. As a one of a kind item, I don't see any comparable competition. It is hoped that the SUB will replace the decades old knife blocks in kitchens around the globe. 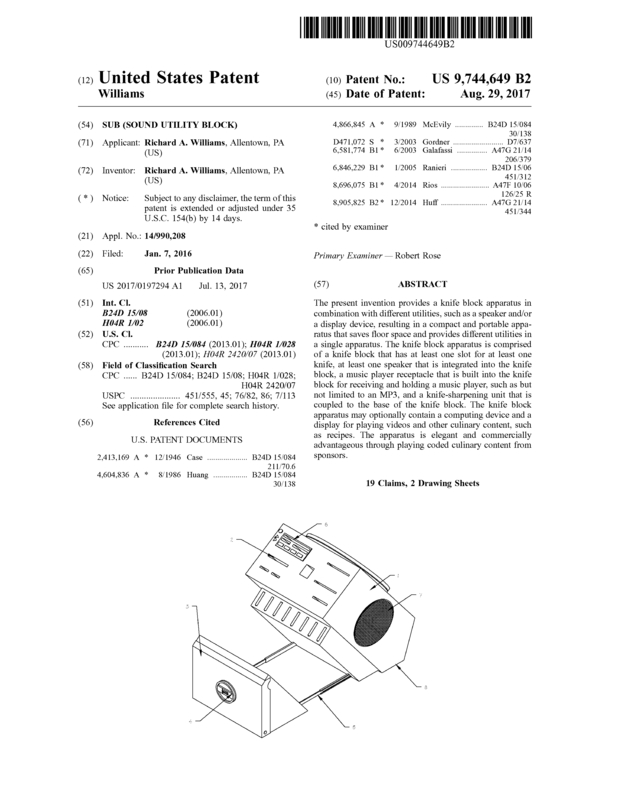 Page created at 2019-04-21 4:26:21, Patent Auction Time.